When asked why he became an attorney, all that Mack Babcock could do was laugh. Babcock can certainly attest to that. His path in life has taken so many unexpected turns that if you’d asked him at age 17 where he would end up, he probably would have said, “working at a restaurant in Hawaii” – which he almost did after traveling there on a family vacation and going as far as to set up a job and lodging. Instead, he woke up one morning and decided to join the United States Marine Corps. He served eight years of honorable active and reserve duty in the Marines, receiving a meritorious promotion to non-commissioned officer at the age of 21. He also received a Navy Achievement Medal for superior performance of his duties, among other accolades. Babcock attended college at the University of Iowa for a degree in Business Administration in Finance, originally intending to become a futures and options trader or a stock broker. But like much of his story, this path took a different turn. But he was good at it, so he kept doing it, working in medical supply sales. He followed his wife, Brighty Melton (at the time his girlfriend), who was attending graduate school at the University of Denver, to Colorado, where he then tried his hand at individual travel sales. But it got to a point when he knew he didn’t want to stay in sales. Babcock was tossing around the idea of an MBA or a JD, and since he had an uncle with a law degree who was very successful, he decided to go that route. He still wanted to get into high finance and be a corporate lawyer, doing hostile takeovers and mergers and acquisitions. He had a mathematically-oriented mind, and he was determined to use it. Babcock applied to the Sturm College of Law at University of Denver and jumped right in. It was like he hadn’t ever had difficulty in high school; he earned the highest grades in his administrative law and basic taxation classes, and he was a semi-finalist in the Hoffman Cup Trial Advocacy Competition during his final year. He also graduated in the top 10 percent of his class and was inducted into the Order of St. Ives honor society. On top of his coursework, Babcock also lent his frenetic energy to several part-time jobs; he clerked for the Honorable Michael A. Martinez in the Colorado District Courts for the City and County of Denver. He also worked for Anthem Blue Cross & Blue Shield, the District Attorney’s Office for the 18th Judicial District, the Denver City Attorney’s Office Employment Law Section, and several small litigation firms. During school, he had trial classes with actual attorneys as professors. Those teachers sat him down after class one day. His teachers pulled some strings to help get him a job at one of the District Attorney’s offices as a student intern in the economic crime unit. Babcock even got to prosecute some civil forfeiture cases in which, under the watchful eye of the district attorney overseeing the cases, he seized the property of drug dealers and other criminals used during the commission of a crime. He even worked with cases that involved prostitution, guns, and drug rings — which was far more exciting than the noise violations and dog barking cases that other students got to handle. He graduated in 2002, and the job market was rough. He decided to get back in contact with the defense firm that he’d interviewed with for a summer position during his second year of law school, Ruegsegger Thomas. The interviews had gone well — considering that when asked “Do you know what workers’ compensation is?” he replied, “That’s the thing where you get hurt at work, right?” But it had not resulted in a job. Law schools generally don’t teach workers’ compensation at law school because it is so unique and specialized, unlike employment law or evidence. It’s one of the areas of law that is picked up on the job. The principal attorney was impressed with his initiative this second time around and they decided to meet for coffee. Babcock pointed out that he had never heard back from them. The principal attorney actually had no idea they hadn’t offered him a job. He thought that Babcock had turned them down. He was hired and given his own caseload immediately. Unlike other types of law offices, where associates just hand papers to principal attorneys during trials, Babcock was conducting his own depositions and trials within weeks. Workers’ compensation is so highly specialized that Babcock ended up staying with the mid-size insurance defense firm for a few years. He defended hundreds of injury claims for several large insurance companies and corporations like Pinnacol Insurance, State Farm, Hartford, Sentry Insurance, Qwest Communications, Furniture Row and others. He then worked at one of Colorado’s premier plaintiff firms as a workers’ compensation, personal injury and insurance dispute attorney. However, after a while he was itching to try something new. He even interviewed with the FBI for an entire year – though the Bureau never tells you why they stop considering you. He found that he could compete for a personal injury case, but his colleagues would refer all the workers’ compensation cases to him without question. Eventually he just accepted his specialty. And he has become a success. He had become very familiar with how insurance companies treat accident victims – how faceless corporations play with people’s lives when they are at their very worst. This is part of the reason he decided to found his own practice. Babcock started his own firm in 2007 in his pajamas, and his mother, Jan Addams, moved into the unfinished basement in 2008 to work as his paralegal at a computer behind him – also in her pajamas. 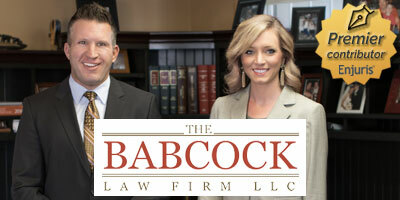 Now a six-person firm, The Babcock Law Firm consists of himself, his wife (Brighty Melton), an associate attorney (Stephanie M. Tucker), as well as another paralegal and a law clerk who will soon be an attorney. Together the team covers everything from workers’ compensation to slip and falls to wrongful death cases. Unlike other firms that will represent both plaintiffs and defendants in insurance cases (meaning insurance companies, in this respect), Babcock’s mission is to never represent insurance companies. As his website states, “We will never represent an insurance company or other member of corporate America.” This is because of the inherent conflict of interest that straddling the fence implies. Babcock is a plaintiffs’ attorney, through and through. He is also one very proud father and husband, and when he is not working 60-plus hour weeks – and when he’s not training for half- or full-distance Ironman competitions, of which he has completed several – he is learning to dance. Both of his children, currently ages 12 and 9, are competitive dancers. Babcock is one of the rare attorneys who truly enjoys his work and likes to be at the office, but he also loves to be with his family. His life has taken some very unusual turns, but when asked if he would change anything about his past, he was adamant in saying that he would not. “If you asked me ten years ago, fifteen years ago, twenty years ago, where I’d be, this wouldn’t be anywhere near it,” he said, the smile evident in his voice. Tap dancing! Well, I knew you held many talents but that’s a new one. Great to have this peek into where you’ve come from and what has made you the Mack Babcock we know today. What a great reminder to take things as they come. You’ve been on quite a journey, Mack. Mack is a great attorney and an awesome person! I have know him for many years and count him as a friend. I love that. Life takes us down some pretty unpredictable rabbit trails, doesn’t it? What we think of a diversion from “the plan” may turn out to be an important next step. Thanks for sharing your story, Mack! Mack was one of the interesting subjects I’ve ever gotten to interview. Thanks so much for such a fun story!